Andhra Pradesh ICET Notification is Advertised by the Andhra Pradesh State Council of Higher Education simply APSCHE Board on 11th March 2018. ICET Exam was conducted for every year by the AP Universities in the presence of the Sri Venkateswara University. Apply for AP Integrated Common Entrance Test to get admission in MBA Or MCA Courses in Andhra Universities from 16th March 2018 to 14th April 2018. In order to apply these ICET Online Application students need to complete their Graduation in Concerned Board. So, all the Suitable students could apply through online @ www.sche.ap.gov.in/icet. Andhra Pradesh ICET Exam purely based on the Computer . We give the Exam centres those are located in AP State only. Choose the Exam Centers to appear for the Exam. We Also recommended for students for more information likely the AP ICET Exam Dates, Hall Ticket Downloading links, ICET preliminary & Final Answer Keys, ICET Result & ICET Counselling dates, also the ICET Syllabus with Previous Years Question Papers PDf With Answers. In this web portal, you could check the Entrance Exams New Announcements in Andhra Pradesh State. Actually, AP ICET Exam will be organised on 2nd may 2018. Apply AP ICET Notification before 14th April 2018 without late fees and 24th April 2018 with late fees of Rs.2000. Andhra Pradesh ICET Notification announced on 11th March 2018. So, ready to apply for this ICET Notification. All the Students who had completed their Degree with the minimum of 03 Years of course. On this @ RecruitmentIndia.in the main web page all interested one could know the important details likely, the How to fill the form in the step by step procedure, Eligibility to enrol the ICET Application form, Application fee details with the Late Fee, Without Late Fee. Here for this ICET Entrance examination, the courses offered likely the MBA & MCA. These Offered courses are especially at the following Universities. Amendments have to notice all the finest points to apply this notice. Must scrutinize the AP ICET Official Notification to apply for this Online form to get the admission in MBA & MCA Courses it needs to participate in Integrated Common Entrance Exam. Check the In detailed notification details. Downloading Rank Card From First week of June 2018. Educational Qualification: Students who want to get admission into Two Years of Course likely in MBA Or MCA they may have at least Degree Qualification with minimum % Of marks. MCA: Students must compleat Graduation in B.Tech Or Any Degree having the minimum of 3 years courses in any discipline & Complete Intermediate in Mathematics. MBA: Students should complete Bachelor’s Degree in not less than 3 years from any recognized University/ equivalent with minimum 50% marks. must have the below of 20 Years to apply this AP ICET Notification. M.C.A. (Master of Computer Application). M.B.A. (Master of Business Administration). 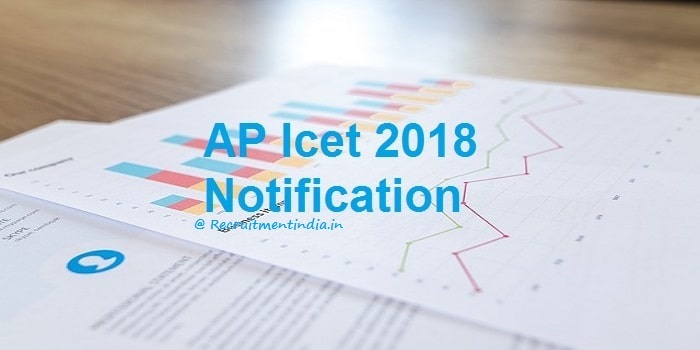 AP ICET Online Application Form 2018 @ www.sche.ap.gov.in/icet So, all the Entrants you must have the clarity about all the Common Entrance Examination announcements which are taken by the responsibilities of the APSCHE Education board. With the support of Andhra Pradesh State Council of Higher Education, the Sri Venkateswara University will be declared the AP ICET Notification. Well, in the presence of APSCHE Board the Notification released 11th March 2018. So, all you complete the ICET Online from within 24th April 2018 with late fees of Rs.2000. The Payment of AP ICET Notification without having the Late Fee on Or before 14th April 2018. So, be finished within the due time. If not, Students may cause the punishment by paying the Punish fee. The ICET Application Fee Details are clearly mentioned on this website. 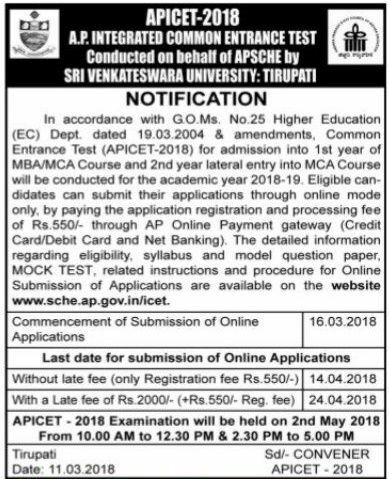 Well, Actually, Andhra Pradesh Integrated Common Entrance Test AP-ICET 2018 will be conducted by the Sri Venkateswara University Tirupati in accordance with the APSCHE Education Board. The eligible Students can also find the link from this site the Syllabus along with the Question Papers with solved Answers PDF. Which will Specifies you to get Qualify marks in the first Year MBA Or MCA Entrance Examination. Based on Test Score the Universities Or Colleges are offered the seats for the merits in PG Courses. Here, The ICET Test Centers are also clearly attached to this article. Obviously, the Exam Centers are given in the Andhra Pradesh State only. So, tick the Test centres in nearby your Current location. Participate in the exam with confident way. AP ICET Exam Counselling dates will be announced soon after declaring ICET Result. So, After the completion of ICET, you need to know the Rank card on this exclusive page. Select the option Likely, the AP ICET Notification / Payment details Option. Pay the fee as per the AP ICET Application form based on the rules of APSCHE Board. Open the Application form by using the Transaction ID & password which Obtained in the Payment process. Print out the Application form with the Payment receipt in spare.